I learn a lot from sports. But this week, what Colin Kaepernick did, is more than merely a relevant analogy about a superstar or lessons learned from a nerdy GM. He refused to stand up for the national anthem. This wasn’t just a gaffe or mistake for which the struggling quarterback would soon apologize, he was making a statement. Here’s how he explained it. This isn’t the first time an athlete has protested police brutality against black people. LeBron wore a shirt that said, “I can’t breathe.” Celebrities do the same; Beyoncé the other day when he called four mothers of victims of police violence up to the stage with her at the VMAs. LeBron and Beyoncé received their fair share of criticism for their actions, but Kaepernick’s protest was so much more flagrant, almost inviting the criticism of his decidedly patriotic league (whose very emblem bears the stars and stripes he refused to submit to). I honor and respect Kaepernick’s actions and his expression of anger. He did a hard thing. Yes, it is hard even if you are rich and successful. A few years ago, Kaepernick played in the Super Bowl, since then, he hasn’t played as well. His cut-happy coach may very well release him. So he has an image to preserve. He knew that doing this would cause backlash and he did it anyway. I think that demonstrates his integrity. But I don’t honor him and stand with him because of his integrity, necessarily. He is not innocent—and none of us are. That’s not why I stand with the oppressed. I do it because the oppressor doesn’t need an ally, and the oppressed do. Jesus stands with those who the police are not protecting. He died for them, once and for all. According to the Guardian, police have killed 709 people so far this year. They are killing God’s beloved. That’s an extraordinary number. It should shock and sadden us as Christians. This is not a small issue. And from my own personal experience, I can tell you, I am often frightened to be around a police officer. Same goes for people in my family. I haven’t been worried for my life yet, but I certainly have been worried about the discrimination that might follow a wrongful charge or accusation. I think standing up for the war-worshiping anthem or even saluting a flag or pledging allegiance is nothing short of idolatry. The backlash that Kaepernick received for his protest showcases the deep-seated nature of American patriotism. That alone is reason to not stand. As Christians, our goal may not be to sort of out the politics or the legislative police reform that may follow. But I believe we need to stand with the oppressed. Jesus clearly did so, and he stood up to state violence. In fact, to the point of death. His interaction with Pilate at the end of his life is not that different from Kaepernick’s protest the other day. 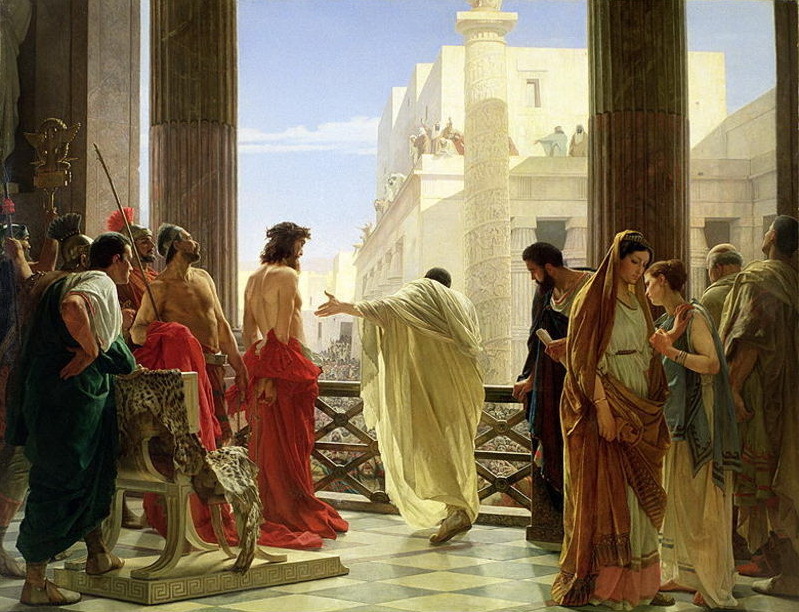 Pilate interrogates Jesus after his own people hand him over to the state authorities. You know how the rest of the story goes, Jesus himself becomes a victim of state violence. I think Kaepernick and his actions approach “belonging to the truth.” I receive his anger well and I want to stand with him too. We may not end up in the same place, but the national idolatry and police violence should move us to solidarity with the oppressed and not rebuke them when they cry out.